There is no shortage of facilities for urgent care in Brentwood. However, in an area where the residents are known for accepting nothing less than the best, the ideal option for a variety of health services in often Michael Farzam, MD and his team at House Call Doctor Los Angeles. Dr. Farzam stands out even among other doctors who make house calls, as he is experienced and fully equipped to diagnose and treat most acute and chronic medical problems as well as minor injuries for patients. 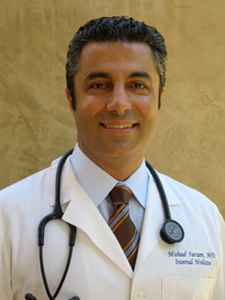 For over 10 years, Dr. Farzam has provided the urgent care Brentwood residents need. He completed his residency training in General Internal Medicine at Cedars Sinai Medical Center in 2004, and today, he is board certified in General Internal Medicine by the American Board of Internal Medicine. Dr. Farzam's patients know that his services best competing house call physicians, and they've even voted him 'Best Doctor'. In fact the accolades of the preeminent expert in urgent care Brentwood also include receiving the distinguished 'Patient's Choice Award' and 'Patient's Recognition Award'. Of course, awards are impressive, but before choosing the concierge doctors for your needs, you'll want to know what their specialty is. Dr. Farzam specializes in treating a wide variety of medical ailments, including high blood pressure, skin infections, cold sores, digestive problems, urinary tract infections and much more. Simply put, nearly any illness or malady can be treated by Dr. Farzam and his team for urgent care in Encino, Brentwood, and throughout Los Angeles. Whether you're in need of convenient urgent care in Downtown LA or surrounding areas like Thousand Oaks or Manhattan Beach, you can always trust Dr. Farzam – the first rate House Call Doctor in Los Angeles. Our mobile physicians are on-call 24/7, 365 days a year, including holidays.